Colder days mean one thing in our house, steaming mugs of hot chocolate. 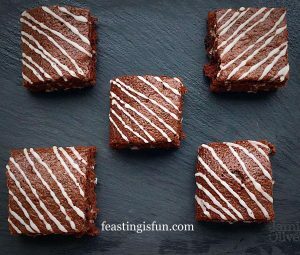 Whether it’s coming in from a chilly walk, huddled around a bonfire, or a bedtime treat, it’s a family favourite. 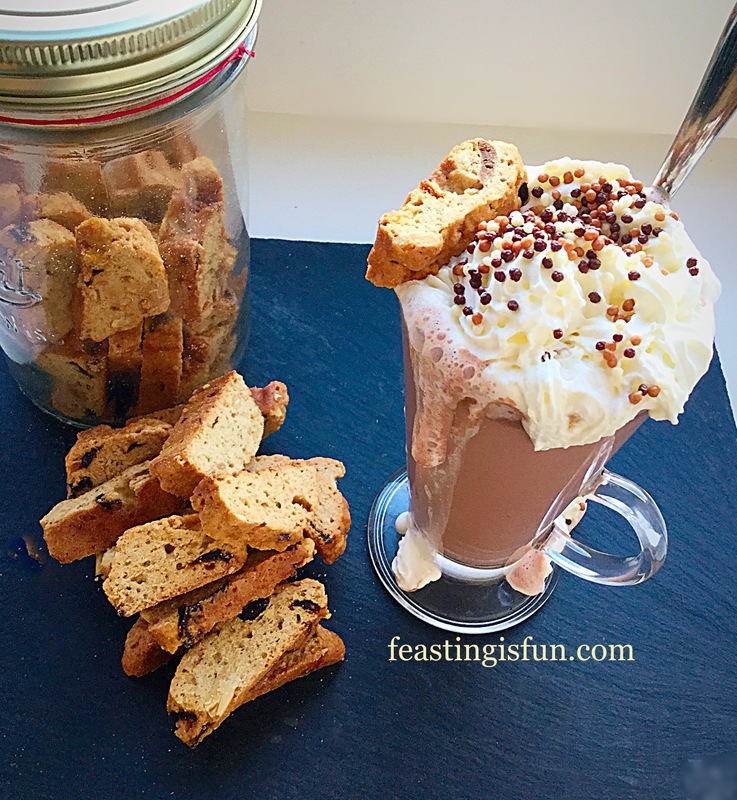 Having won some Cranberry and Almond Biscotti from Daylesford Organic in a Twitter competition, I wanted to create an adult drink to compliment them. Welcome to my Luxury Amaretto Hot Chocolate. 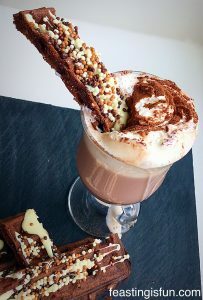 Luxury Amaretto Hot Chocolate a delicious flavour combination. Amaretto is a sweet, Italian, Almond liqueur. Since chocolate goes so well with nuts I thought I’d add it to this hot drink. Oh my! If you love almond and chocolate, you will literally go nuts over this drink! 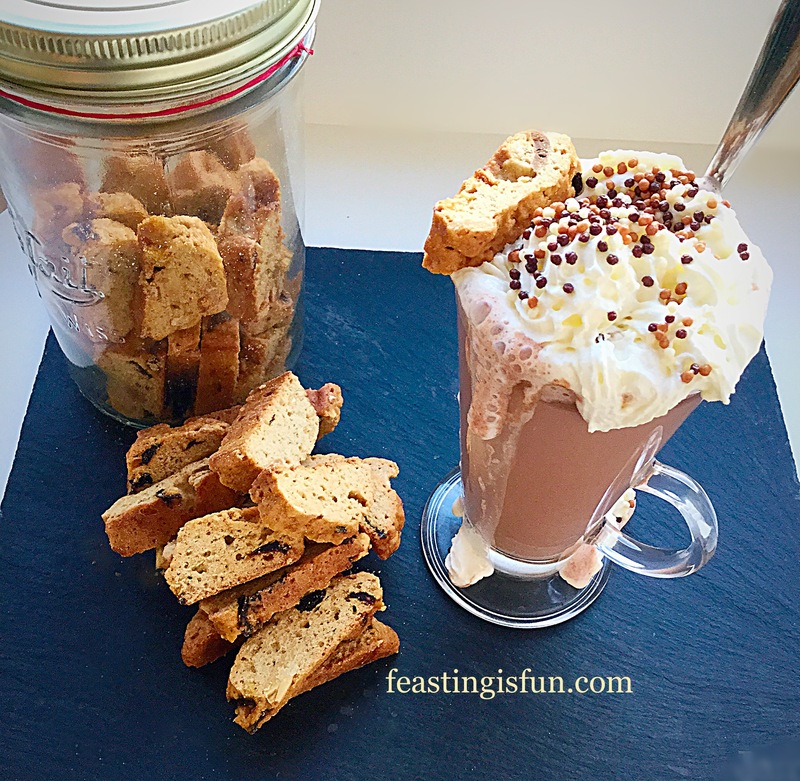 Luxury Hot Chocolate without the Amaretto for a fun, festive, children’s drink. Regular hot chocolate mixes are generally a mix of cocoa powder and sugar. For this luxury version I wanted to use real, dark chocolate. 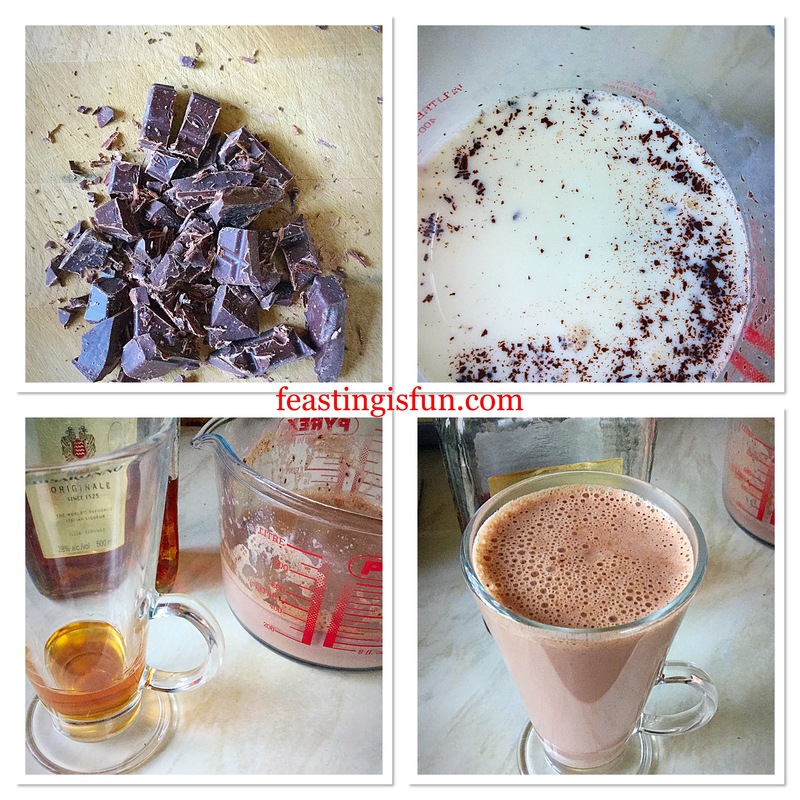 Melted into the hot milk, the dark chocolate takes this drink to the next level. In fact, no sweetening is needed, so leave out the booze and this drink is perfect for children. For adults though, the addition of a splash of Amaretto, creates a delightful, warming drink, that goes down too easily. 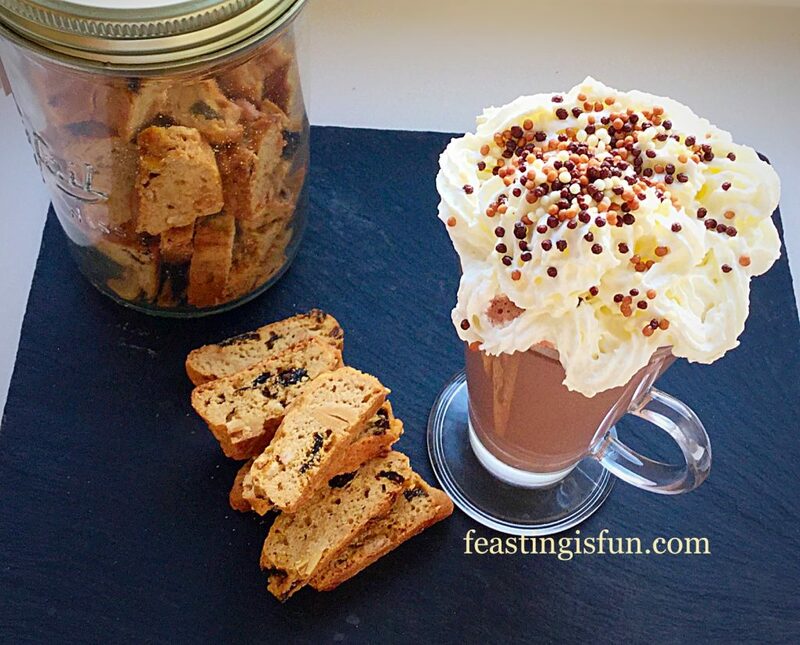 Luxury Amaretto Hot Chocolate served with cranberry and almond biscotti. Since this, is a luxury treat, it is topped with whipped cream and crunchy chocolate pearls. Toasted, flaked almonds would also provide a crunchy topping, indulgently eaten with a long handled, sundae spoon. Luxury Amaretto Hot Chocolate served with a spoon. 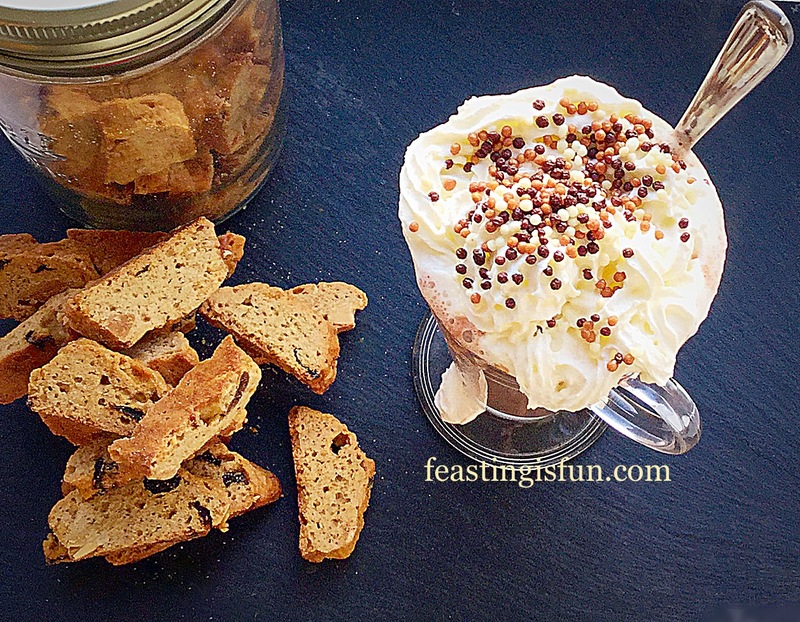 The Cranberry and Almond Biscotti complimented this incredible drink perfectly. My only concern is that they aren’t really long enough to dunk! So, I’ll be working on a recipe as soon as possible for us all to share. Meanwhile my prize is very gratefully being devoured, here at home. 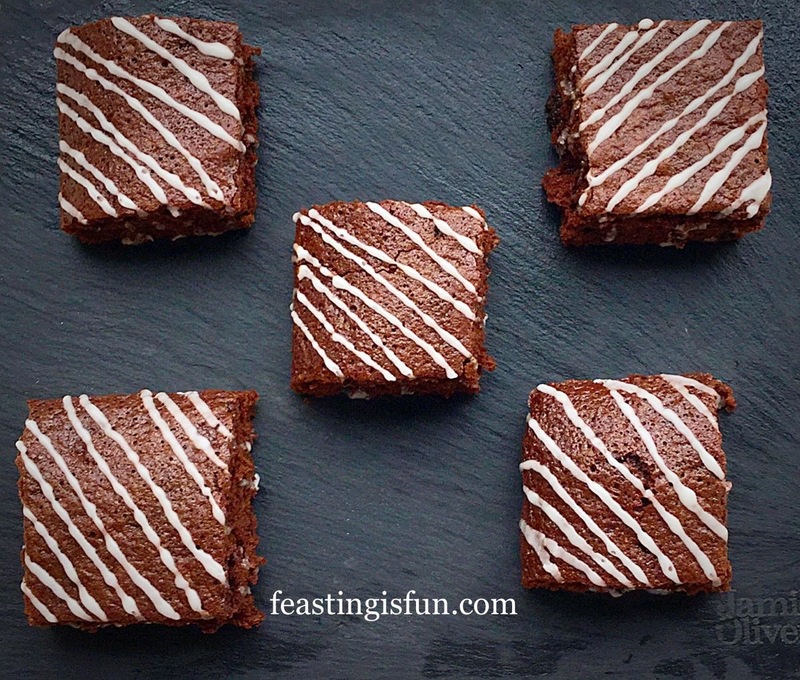 It’s a real treat not to have to have baked them myself. Also, they are not baked until they are jaw breakingly hard. An absolute bonus, these biscotti are delicious. While creating the recipe, I used amounts for one drink. If making more than 3 drinks it would be advisable to heat the milk in a saucepan, over a medium heat. First of all, measure out the quanity of milk needed into a heatproof, microwaveable jug. Place the jug into the microwave and heat on high for 1 minute (per serving). While the milk is heating finely chop the dark chocolate. Add the chopped chocolate to the warm milk and stir. Return to the microwave and again heat for a further minute (per serving). Keep an eye on the milk to ensure it doesn’t boil over. Once heated, remove the jug and gently whisk the melting chocolate into the milk using a balloon whisk. 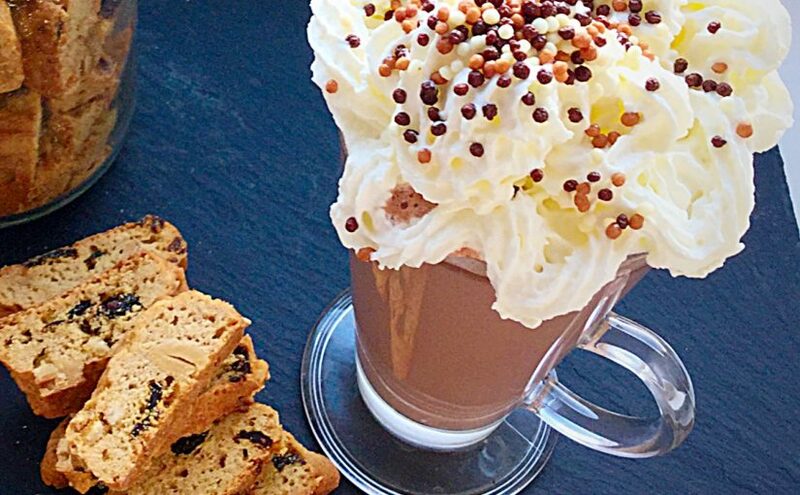 Pour the Amaretto into latte glasses and then pour over the hot chocolate. Making the Luxury Amaretto Hot Chocolate. Top with whipped cream and your choice of sprinkles, add a long handled spoon and serve. 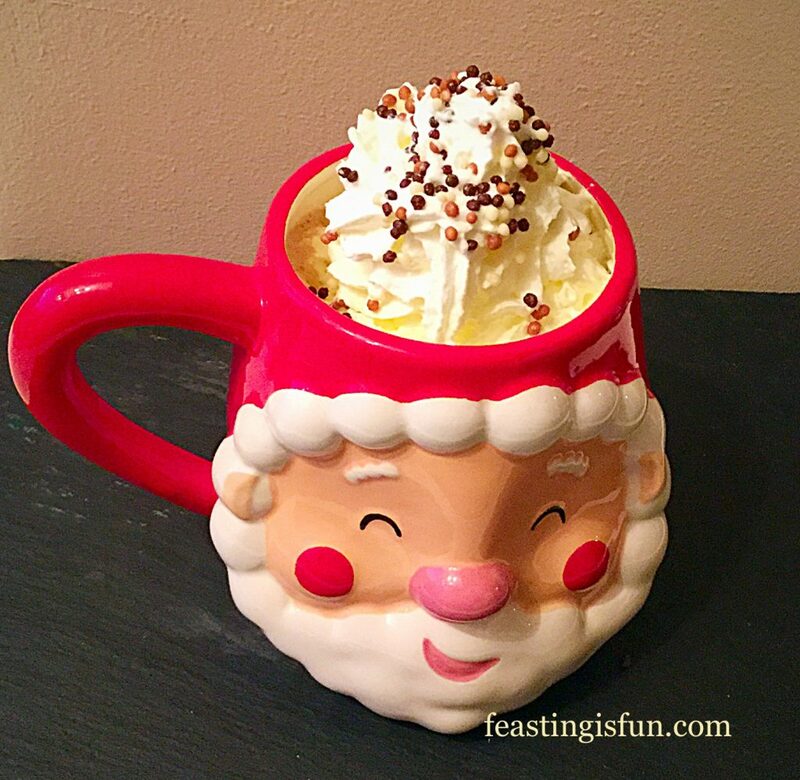 Luxury Amaretto Hot Chocolate a great festive tipple. This drink is the ultimate in homemade luxury. The combination of hot chocolate and the warming almond liqueur, results in a drink that really is the equivalent of a big hug! While this drink, with all of the trimmings, is a treat, using real chocolate is really worth trying. The lack of overt sweetness, results in a really chocolatey drink. So much so, I am considering chopping up a big bar of dark chocolate and storing it in a tin, ready for use. An alternative drink, for those who don’t or cannot drink alcohol, is to add a drop of almond extract to the hot chocolate. The almond/chocolate flavour combination will still be present, without any alcohol. 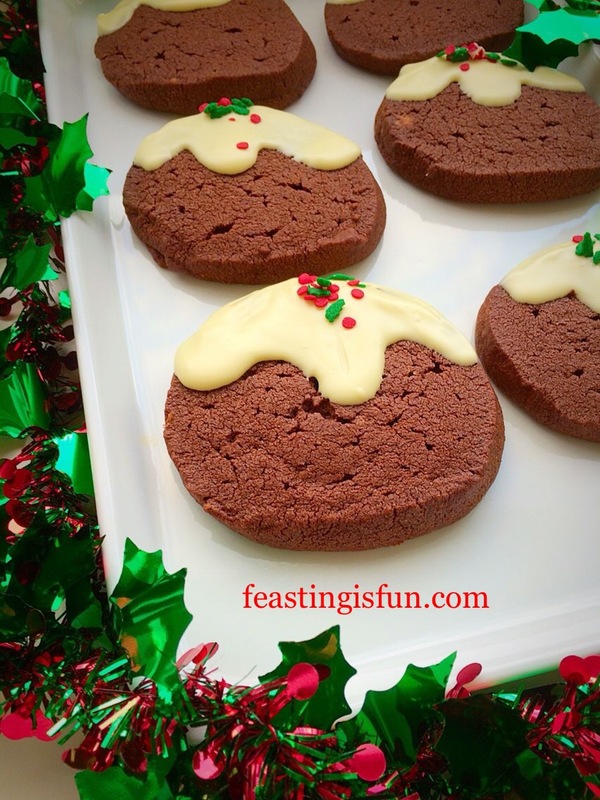 Whatever you are creating, making and baking, during this festive period, have fun. Christmas is a time for feasting and celebrating. Make sure you have time to unwind, relax and most of all not cook! Yes I’ve said it. As much as cooking, having guests round and visiting people is fun, it’s important to have a little time to ourselves. So that we can enjoy all of the other parts of Christmas, without it becoming a burden.